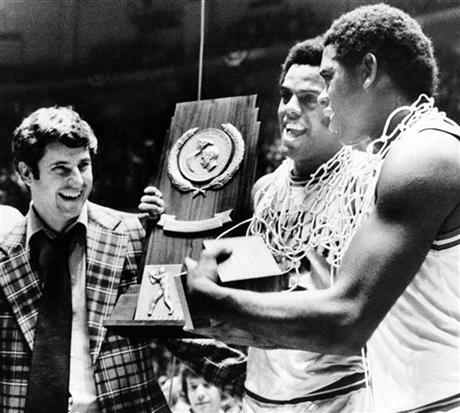 Do You Want Your Project Manager To Be Like Bobby Knight? Clearly, Bob Knight is a great risk manager. What I like about his message is that we have to work hard to clearly identify and counteract the risks we face in order to succeed. We can’t just hope for the best. When we do risk management, we should really look for risks and take real actions to mitigate them. We should take specific actions and track specific results to be sure that mitigations are working. Knight is right about that. But, I’m having a tough time with the “Power of Negative Thinking” thing. (I have to admit here that I’ve only read 20 pages or so that were available on Amazon’s preview). Maybe it’s how he went about being a great risk manager. My impression is that Bob Knight was a pretty demanding and uncompromising manager. In the book, Knight says he had a slogan posted in his locker room saying “This ain’t Burger King. We’ll do it my way.” Can we really be successful in endeavors outside of basketball by following the iron willed approach of a coach to win by relentlessly fixing mistakes? I’m going to ponder this question a bit and see if I learn anything. My philosophy encourages project managers to imagine perfect outcomes from their projects and perfect journeys for their teams. Bob Knight sought perfection from his players on and off the court. For Bob Knight’s basketball teams, a perfect journey was planning and preparation that led to games without mistakes and success in school. The perfect outcome was winning games and championships and graduating players. And then do the same for the next season and all those to follow. He had a philosophy and processes and he followed them and expected his assistants and players to follow them. Maybe Bob Knight was a “Lean” practitioner. Let’s consider the principles of the Toyota Production System (TPS) or “Lean.” Lean is a philosophy and set of practices that drives waste and mistakes from processes. It works to eliminate anything that does not add value and seeks to deliver a perfect result. When I review the 14 Principles of Lean, Bob Knight seemed to follow those that apply to basketball. He had a long term philosophy, a process, he took things one game at a time, he worked to fix problems as they occurred, and standardized his approach to games and coaching. He grew leaders and teams that lived his philosophy, worked the details face to face with his players, did his research and planning before making decisions and then acted decisively, and relentlessly tried to improve to stay ahead of the competition. But, what about the chair throwing and the iron willed drive to win? I re-watched “12 O’clock High” recently. I think all Air Force Officers were shown this movie in leadership training. The commander had to get “maximum effort” from his squadron of bomber crews learning to fight a new kind of war. Inside, he was a regular guy wanting to take care of his troops. But, in a war with incredibly high stakes, he had to drive everyone to perfect execution and maximum effort to win. He did, but the toll on everyone was immense. I wonder what the toll on Knight and his teams was from his relentless drive to perfection. Are sports war? Is business war? Are projects war? Maybe the perfection I’m talking about and the perfection of Bob Knight and the bomber crews are different things. I think looking for what can go right on your project involves understanding what will drive the sorts of outcomes you want from the project in terms of sustainable improved performance and building a stronger organization. I think good projects require good risk management to eliminate mistakes, but also require a vision for growing a more effective and stronger organization. Perfect outcomes are broader than winning the scope, schedule, and budget game. Thinking back to TPS and “lean,” a practice I think is an important part of how to find what can go right on a project, maybe there are some things that Bob Knight wasn’t doing. TPS has an underlying philosophy of making the world a better place, working with partners and even competitors to learn and share new practices, and creating self-confident team members who find ways to solve problems. Considering this, TPS is more than eliminating waste. It’s building a culture that sees eliminating waste as a way to a better life and a better world. Lean is searching for a perfect journey to a perfect outcome. Maybe Knight was trying to make the world a better place for his players and by the example he was setting. Maybe not. In the end, my pondering comes down to balance. I guess I’m worried about Bob Knight’s “The Power of Negative Thinking” as being too focused on preventing mistakes without the balancing influence of building people up, letting them learn from their mistakes, and finding opportunities that reach beyond the game or season. The good ideas in his approach to being a successful basketball coach may not work for us if we don’t balance looking for what can go wrong with looking for what can go right. I guess what I learned is that you can be successful in some arenas by focusing on relentlessly driving out risk and pushing for maximum effort. It’s not enough when the stakes are high to casually consider how to beat the risks. So, the maybe the same is true when considering what can go right. If we aren’t at war or trying to win a basketball championship, but have high stakes in making changes and creating a foundation for sustained success, we need to look just as relentlessly at our opportunities to achieve perfect outcomes in terms of how the organization and its people grow as a result of our projects. Dedication to both sides of risk will take us further than looking at only one side or the other. This entry was posted in Uncategorized and tagged Balance, Benefits Realization, Caring, Finding What Can Go Right, Lean, Perfection, Project Management, Risk Management, The Journey by Glenn Briskin. Bookmark the permalink. This is interesting. The Power of Negative Thinking! I get the point – but like you- I shudder at the thought of the vibes “underlings” would get. I shudder when I read Leadership Literature and people talk of subordinates. I write a lot about Positive Leadership so I will drop back from time to time to see what others say. My visualization goes straight to the flock of geese and the way they form – with the leader dropping out when tired and another moving to the front to take up the slack. Not much of an empowering formation happening in the Negative Leadership style. Still and all it must have worked for him and there would be reasons why he ended up that way. Like you I would rather opt for balance and distributive leadership. Great blog post. I agree Bobby Knight was no doubt a great Risk Manager. In my opinion, by focusing on the probability of risks in a project, one is ultimately focusing on the desired end state (which is a positive outcome). Encountering risks on projects is a certainty and by logging them and monitoring the “triggers” you’re actually controlling the positive outcome. Remember not all risks are negative. There are always opportunities. That’s my spin on it! Sounds right to me. Thanks for the comment. Good post. Some quick thoughts. I grew up in Kentucky and Indiana was an arch rival. The one thing I always noticed about those Indiana teams is they did play to avoid losing versus playing to win. The best teams and individuals do not fear failure because they know it is a step to success. You were not allowed to fail in the Bobby Knight system, so you never really learned. But you did learn to CYA so that if the team did lose, Bobby could not blame you. I think there is one more thing we can learn from Bobby. A dictatorial leadership method works when the team being lead is green and has no semblance of how to do the job. This is somewhat true of college kids, but not 100% true. Not letting the kids have any input tells them they are stupid. Low self-esteem has never been documented as a key to team success. Thanks for a great comment, Greg. You can manage risk to the point of driving out what can go right.